Have you heard of the magazine Ottobre? Jump here to read more and enter the giveaway. Stay where you are for another giveaway. Star giveaway! Because seeing stars is sometimes a good thing! Check them out at his shop and cleverly tell me which one you love. Leave comments on this post for the star giveaway. 01 Only one comment, please. erase your first comment before leaving another. 03 Winner chosen at the end of the month. It's also nice if I can contact you somehow. Me first, me first! I love Ottobre!! But I've only ever seen their website. And I think the colors in the Lucky Charm star are my favorite! I love Lucy in the Sky. Love "Cloudy Blue and Turquoise Too"
Do I really have to pick one star? 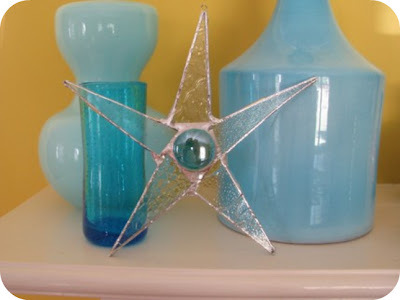 I would love the personalized glass star If I could pick. If I was to pick, it would be the red textured star which would be beautiful in my sunny kitchen window. I love the Fall-ish Star. Fall colors are my favorite! All the yellows, reds, and oranges. So rich and warm! Lime in the sky is my favorite! I really like the seafoam star and the deep seafoam memory star. They are beautiful! Graceful Kelly would be my pick - for my brand new neice Zia. Tell your Dad thanks for sharing! Some day I'm either going to win, or learn to make these, because they rock. Lucy in the Sky, of course. The beatles are THE band of my youth, and now as an aging hippie I find their music a continuing source of comfort and joy. The different glasses, all clear and yet opaque in sections, allow the differing aspects of the sky to shine in the design of the star. I love it. Lucky me--you know all my vital information! My daughter and I love Lucy in the Sky Tickled Pink.. She calls it a pinkalicious starlight and says we should hang it in her room to make it beautiful! I'm partial to Pink Clouds. It's so sweet and girly. I think that your dad is... SQUIRREL!... awesome! He 's inspiring with... SQUIRREL!... his love for the arts. I love how he just itches to... SQUIRREL!... create! I think he's been my favorite of your guest... SQURREL!.. bloggers (but you shouldn't choose favorites right?) I love the happy...SQUIRREL!.. star! Root beer makes me smile, too! to have such a talented Dad?? Okay, that was totally corny.... sorry. Wow. That star would look amazing in my kitchen. LOVE those seafoam memory stars! happy squirrel's my favorite hands down. Your dad is awesome. I love the dancing stars, gracefully kelly, and the seafoam memory- oh crap, that's not just one. They are beautiful! Something clever? I'm drawing a blank...but I do love the Lucy in the sky, both the clear glass and the pinkish lavendar. And the lemon yellow one. I love Lucy in the Sky! Please send it to me before I die. A long painful starless death. Where with my last breath. . .Knudsen. . .Star. . .please! The red dot special is great too. I love red. I love "Clear Dancing Star"! How cool are these stars?!! Think I definitely need the seafoam memory star because I'm losing my memory!! Atlantic Ocean Star. Oh my goodness... it makes me think of this lake that I love in British Columbia Canada. It is the most vivid blue, surrounded my mountains and evergreens. It is breathtaking. Orange you glad you picked ME to give the orange you glad star to? Definitely the fall-ish star. I love the fall colors and would be a great addition to my lack of fall decorations! I love the atlantic ocean star! Such beautiful colors. I love ottobre magazine. I highly recommend it for anyone who loves to sew. I love the red glass star! I have stars all over my house, and would love one that is handcrafted by a fellow Etsian! sun dancer would hang perfectly in my kitchen window PLEASE!! "orange you glad i live in your kitchen?" that is what the orage you glad star would say every day when i walked in to cook and clean. oh crumb, now i forgot the name. (i was reading everyone elses favorites) i liked the purple one. well, i actually love all of them, but i'd say purple was my favorite. There are beautiful and completely unique! I like the "Cloudy Blue with Turquoise." Lime in the Sky is gorgeous! I think your Dad's stars are beautiful. I would love to have the Ruby Red Dipper Star. The stars are gorgeous. I like Lucy in the Sky tickled pink. Actually, I like them all. I am like a clear dancing star shining brightly! Shining for the whole word to see. I love the different textures. So lovely. to which I'd reply: no, i'd let bananas go forever if it meant an Orange You Glad star with turquoise center. thank you. Love the Lucy in the Sky tickled pink one. My daughter would love it in her room. I love shiny things, so it is too hard to pick just one. With a name like Fairy Plum Star...who wouldn't love it! I love them all and would be hard-pressed to choose just one, but the sun dancer with the yellow center would looks awesome in my blue living room. Like a Diamond in my Eye. Ok, so I'm not much of a poet. Those stars are totally awesome, though! hahah... seriously don't know if i even understand that. Lime in the Sky is definitely my favorite! Thanks! I love the cloudy blue and turquoise one. I would love to gaze at that when things get a little crazy with my three little toddlers - it looks so peaceful. Oh my. I love these stars and I jumped around looking at so many, being drawn to so many, but I really love the Seafoam Memory Star - it's lovely. your dad is quite talented. I love his cloudy blue and turquoise one. Thanks for sharing. Oh I love your dad's stars! They are so beautiful! I have no idea which one I would pick they are all lovely! I love the simplicity and comfort of the believe star...I would love it in my bedroom. i so love the pink lucy in the sky, then again my 19month old girl is forever singing "twinkle twinkle itttil tar" and am sure she would just love any star (they are all pretty). very clever papa u have! I'd love the seafoam memory star. Your family is so talented! It is very inspiring! Thanks for the opportunity and keep blogging. I la la love your Dad's stars! 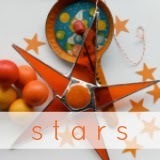 I think the fallish star or orange you glad would be lovely in my sunroom:) WHat a fabolous giveaway! By the way--I finally got out my sewing machine and made some 'rustic' notebook covers and pillow slipcovers. They turned out very cute--thanks for the inspiration at No big dill to get busy sewing! Clear Dancing Star looks about as happy as I feel after the end of a long day when I come home and see my hunny. I was having a hard time choosing and then I got to that one and it made me grin. I like deep sea foam memory. It would go perfectly in my bedroom that is an ocean theme sanctuary. Or it should be. The star would definitely help the sanctuary part. oh my! they're so so so gorgeous! I think the Deep Sea Foam Memory is my favourite, though... all those textures!!! I love the Happy Squirrel Star. Can't be much better. I would love the clear dancing star to twirl in my window, creating light and joy for my children. I love both of them, thank you for the chance to win! There's no stars like yours, there's no stars like yours... If I click my heels 3 times will it make me the winner? love the ones with a pattern on the inside. the blueberries and rootbeer draw my attention. These stars are gorgeous. I think I need one. Thanks for another great contest! those stars are wonderful !! I love the red one (my favourite colour)...would it travel to me ??? I loves me some orange! I've wanted a Knudsen star for a long time now. They are so beautiful! The stars are so beautiful! I love the Vintage Korean Ramie! Stars are my favorite shape, I def need this :) it's beautiful!! Love the gorgeous Lucy in the Sky for my daughters' room! I wouldn't mind having a piece of your home in mine, to remember you always, of course :). I love the new stars with fabric behind them. Especially the blue ones. Star light, star bright, be mine tonight! I am seeing sparkly cranberry stars on my tree this season. Thank you! They are all so starlicious it is hard to decide on just one. The green star is lovely - so vibrant! I still really love the dancing stars - what a great mental image! I love the Graceful Kelly. It would go beautifuly in my newly painted green kitchen. To brighten our holiday tree. lime with lace center is my favorite but I love them all. I love these stars so much--I've seen them around your families' blogs for months and love them all. I'd love one for my aqua/orange/red kitchen. Love the second trade hotpad star, so so cute. The fabric backed stars are incredible. Thanks for sharing. win any color star. Thank you. I love the orange you glad and the atlantic ocean. They are so beautiful and would look great in my kitchen. I LOVE the whimsical handmade quality of these stars! And seeing them all over your blog pictures all the time has increased my adoration! I would love a lime in the sky to hang in my lime green kitchen! Flora Lime with the leaves in the center is beautiful.... I felt so hopeful when I saw it in your Dad's store. And, -it's a yummy color to boot! Love love, love the flora lime lace!! !